You put a great amount of effort into organizing an event, but may often get worried about how many people will show up at the event and how you can help them get the most out of your event. There is a lot to consider for event promotion, but don’t be overwhelmed! Here, we provide a guideline on how to compile your marketing strategies and make good use of recent technology to increase event attendance and attendee satisfaction while saving time and efforts. Your event’s goals are what your marketing plan is based off of, so you must absolutely set them before moving onto the next steps. Ask yourself - Do you want your event to achieve a tangible goal such as attracting 700 attendees, or an intangible goal such as strengthening relationships with your association members or business partners through the event? Just make sure that your team is on the same page and pursuing the same goal. Big or small, you should also be aware of the budget allocated to your marketing effort. While constraints will set limits on certain things, they’ll also show you where you can get creative. Keeping the goals in mind, prepare the marketing content such as the event schedule, speaker list, and key messages to highlight (e.g. benefits of attending the event, keynote speeches, testimonials or a video from the previous event). Some recent event management tools like Agenda Center automate the time-consuming tasks and reduce human error. For example, once you upload the agenda to the dashboard in a spreadsheet, it creates a sleek agenda table that you can easily insert in your event websites and any other web pages. Any update will automatically sync with all the websites as well as the Whova event app. With Whova's Agenda Center, it was quick and easy to integrate agenda into our website. Updating the agenda across platforms (website and mobile) is efficient. I appreciate being able to make quick updates in one central location. To properly identify your target market, you need to define it through attendee’ demographics such as age, gender, and industry as well as psychographics such as usage of technology, interests, and motivation to attend your events. You can first analyze attendee data collected from previous events. Most importantly, technology usage will tell you what channels and tactics are effective means of reaching out to them. While older folk may be better informed through more traditional methods, young adults are almost exclusively found through digital channels, such as social media. In general, event listing websites such as Eventful, Hey Event, and 10times, are good places to promote your event, regardless of the age of your attendees. If you’re not familiar with these sites or you don’t have time to post on each listing, try an automatic event listing service that can post to well-known event listing websites for you. Marketing is all about engaging audiences, so you really have to set your communication tactics straight. Consider how to effectively inform people about your event. While there are general e-mailing systems like Mailchimp, it is much more effective to use both e-mail and push notifications via an event app. For example, you can reach open rates of your messages from 70% and up, compared with the event industry’s average e-mail open rate of 20%. It's not only effective but convenient as you can send messages through both channels with one click (Request more information about the Whova’s announcement system). The Whova app was a great organizational and communication tool for our meeting participants. The app's signature style allowed us to engage each other throughout the event. 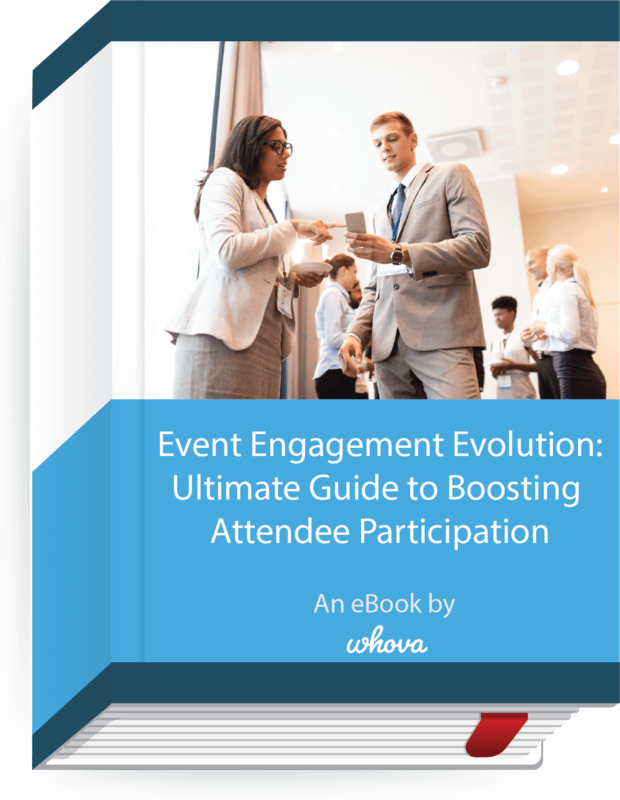 We look forward to using Whova for future events. You and your sponsors / exhibitors share the same goals in terms of attracting more attendees at your event and increasing brand visibility. You should use this common goal to motivate them to participate in promoting your event. For example, you can request them to help pass on flyers or encourage them to spread the word about your event on social media. If you happen to use the Agenda Center for your event website (shown in the Step 2), your speakers can conveniently promote their sessions on social media with one click. On the other hand, you can increase speakers / exhibitors visibility through event websites as well as ad banners, company profiles and coupons/giveaways on your event app. It’s a win-win strategy! In regards to marketing, the final stretch before the event is a stressful one as you not only try and get attendees to go last-minute, but also raise excitement for those who are already going. It’s a good idea to create buzz on social media in an organic way. Set a good event hashtag and drive registrants to tweet their excitement. In our observation, many successful events provided a place for their attendees to virtually interact with one another ahead of time. It helps create buzz and spread words through registrants. One example is the Event Bulletin Board on Whova. It has been attendees' and organizers' favorite feature and many events had more than 1,500 posts with >70 custom threads. They can ask any questions to organizers, schedule carpools, create a custom topic to chat about, ask for help on finding lost items, etc. Request a demo if it sounds interesting to you. In your marketing plan, write out what exact metrics you’ll use to to evaluate your event’s performance, such as the number of attendees, networking activities, or social media posts. Many event management systems (e.g. event apps) help you collect the data. Use the statistics in a report to show your team and stakeholders your event’s success, as well as for promotion in a newsletter or PR purposes. The data and the insights you gain will help you make the next event you plan even better. For example you can use them to attract new sponsors, improve certain logistical aspects of your event, and, of course, further increase attendees. Follow a step-by-step timeline guide to create an engaging event. Get to know recent event tech trends and learn from real examples.